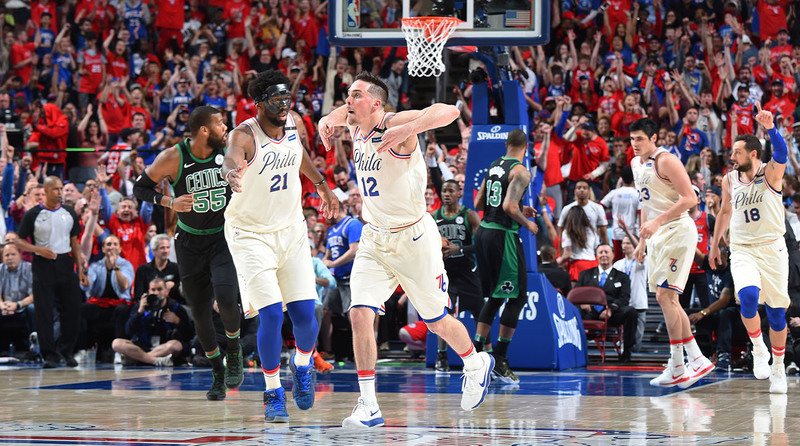 Brett Brown inserted point guard T.J. McConnell into the starting lineup for Game 4 and the Arizona product scored a career-high 19 points to extend the Sixers' season. PHILADELPHIA — The 76ers live to die another day. Philadelphia won its first game of the second round Monday, finally besting the Celtics in a 103–92 win. T.J. McConnell started for the first time in the postseason, and delivered with a career-high 19 points in 39 minutes. Dario Saric chipped in with a game-high 25 points of his own, but the series will shift back to Boston with the Cs still holding an imposing 3–1 lead. McConnell was the story Monday night. He started in place of the struggling Robert Covington, and he brought an energy to the game that the Sixers desperately needed. There will be a lot of talk about McConnell’s toughness, or intangibles, or grit, or hustle. It’s an insult to his skill. McConnell was impressive offensively, taking advantage of any defensive lapses by slithering his way into the lane. His speed and ability to stop and start challenged Boston, and helped him earn easy looks. McConnell hit all but two of his shots in the paint, and all but three of his nine field goals came in the restricted area. He was a legitimate problem for the Celtics’ defense, which was perhaps too focused on Philly’s other weapons. McConnell was a plus-18 for the game, and he and Saric were the only Philly starters to shoot better than 50% from the field. “There’s an injection of energy you immediately know you’re going to get with him,” Brett Brown said of McConnell. Brown repeatedly praised McConnell’s tenacity, and said the decision to start him was in part to help lift the spirit of the starters. Saric was also a positive. His 25 points were well-earned, as he routinely fought his way into the paint and also shot six free throws. The offensive performances of McConnell and Saric came in the wake of two more uneven performances by Ben Simmons and Joel Embiid. Both had their moments in Monday’s Game 4, but both still haven’t played up to the potential they flashed in Round 1. The Sixers went on a decisive run in the late third and early fourth, and that came with Simmons on the bench. Embiid made only six of his 15 field-goal attempts, though him hitting two of his five threes is a win for the Sixers. It was far from a perfect game for Philly. The pace was still at a snail’s preference, which has typically favored Boston in these playoffs. We still haven’t seen the run-and-gun Sixers team from their win streak through the first round, and Philly is still struggling to shoot the ball with any consistency. After the game, Brad Stevens pointed to turnovers and offensive rebounding as two problem areas, and dominance in those categories certainly helped carry the Sixers on Monday. Brown admitted his team still isn’t quite playing to its identity, saying he hopes to play faster moving forward. The Sixers are far from out of the woods. Embiid said as much in his press conference, agreeing that Philly didn’t play its best game. Energy can only take this team so far. If the Sixers really hope to pull this series out, eventually they’ll have to get into the open floor, play more possessions, and find the shooting touch they had toward the end of the regular season. Boston is in the driver’s seat as the series shifts north, and the Celtics are still dictating the style of basketball being played. But playoff games can often swing in the margins. Philly found what it needed Monday with the inspired play of guys like McConnell and Saric. Their performances guaranteed the Sixers’ season won’t end Monday, but not much more than that.